Shakhaf Barak wrote to a friend highlighting the history behind the current referendum that is dividing the city. He has kindly allowed Voice to use it, almost verbatim as the deadline approaches for voting. Here in Aberdeen there is a bitter referendum taking place, and it could go either way. Over 70,000 people have voted thus far, in a city of barely 212,000 souls, and both sides have reported each other to the police. Central to this story is a 250-year old city centre park, Union Terrace Gardens, and the billionaire oil tycoon seeking to redevelop it. Union Terrace Gardens are similar to Edinburgh’s Princes Street Gardens, lying in the natural amphitheatre of the Denburn valley, the Denburn being a stream which flows right through the city, underground where it borders the Gardens. Much of Aberdeen’s best architecture was clearly envisaged to overlook this area. The Gardens are home to a cluster of 260-year old elms trees that once formed part of the Corbie Haugh, a historic wood which ran through the valley. This is among the largest concentration of healthy mature elm trees in Europe, and they are reputed to have escaped Dutch Elm Disease, not only due to their isolation, but also because the pollution of the city has afforded some sort of protection from it. Both the park and its beautiful Victorian toilets are Grade A-listed, and all of the trees are under preservation orders. Up until as late as 2003, the Gardens formed the centrepiece of Aberdeen’s Britain In Bloom entry, and they were truly stunning, but since then expenditure has all but ceased, and the toilets have been closed for several years. 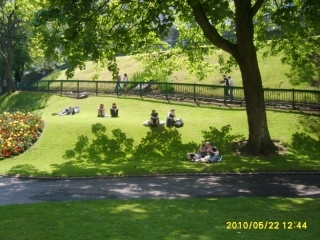 In 2008 a local arts organisation, Peacock Visual Arts (PVA) was granted planning permission for an award-winning and sympathetically-designed arts centre to be built into the hillside of the Gardens. This would have meant felling a small number of trees but none of the elms. The design was universally acclaimed and it was hoped that this scheme would help regenerate interest in the Gardens. Enter Sir Ian Wood, one of Scotland’s richest men, and chief of Wood Group PSN. Sir Ian decided that he’d like to redevelop the Gardens by building a five-storey bunker in their place, whilst covering over the adjoining railway line and urban dual carriageway, with the entire roof of this construction forming a flat civic square at street level. It was not entirely clear what would be installed in the bunker, although speculation was rife to say the least. He offered the council £50m towards the cost of this project, which was mooted to cost £140m. This was possibly an optimistic figure since Union Square, a similarly sized shopping mall with none of the technical difficulties or prior excavation work, cost £250m to build. The council felt this offer was too good to refuse, but the some members of the public were up in arms. Sir Ian decided to put the proposal out to public consultation and promised to walk away should the public reject it. The ‘consultation’ was commissioned by Aberdeen City and Shire Economic Future (ACSEF), a publicly-funded unelected QUANGO, and conducted by The BiG Partnership, Scotland’s largest PR company. It many ways it resembled a marketing exercise. The bulk of participation was via a website, which asked several questions with a somewhat loaded feel to them. For technical reasons, the question on whether or not to proceed with the plan defaulted to a YES vote. If, during completion of the questionnaire, any previously-given responses were subsequently amended, this again defaulted back to a YES vote. When the results were released, it became apparent from the comments sections that may people who had intended voting NO had instead been recorded as YES voters. Over 10,000 people participated in the consultation, and In spite of it’s technical oversights, the public voted against the Civic Square proposal by 54%-46%, a healthy and significant majority. However the PR machine kicked in and somehow spun that the 202,000 people who had not participated possibly represented a silent majority in favour of this scheme. Sir Ian decided not to walk away, and the project went to a council vote. The council voted in favour of taking the plan forward at the expense of PVA who by that time had 80% of their £20m funding in place. It has subsequently been alleged that some of the PVA funding was diverted into the new project. The BiG Partnership now re-launched the plans under a new name, The City Garden Project (CGP). 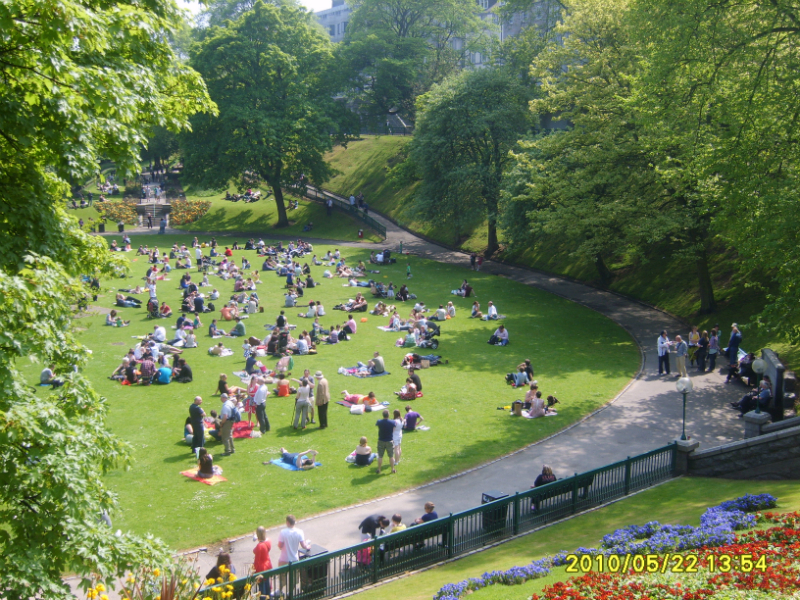 It was claimed that the outcome of the public consultation was that the public were broadly in favour of a garden as opposed to a civic square. Any implication that they were actually in favour of preserving the existing gardens was ignored. The interested parties now felt that the best option was to redevelop the Gardens by building a five-storey bunker in their place whilst covering over the adjoining railway line and urban dual carriageway, with the entire roof of this construction forming a new garden at street level. The whole thing had an air of déjà vu. This time it was decided to hold an international design contest, paid for with public money. Six designs were shortlisted from hundreds of entrants. One, The Granite Web, bore a striking resemblance to Civic Square concept, albeit with less concrete and more greenery. Critics described it as a cross between Tellytubby Land and a skate park. The local press heavily promoted the Granite Web design from the outset of the contest, leading with it on their front page and providing it with more photo coverage than the other designs. It was almost as though it had been ordained. The public voted, and spoiled ballots aside, all indications were that The Winter Garden design proved the most popular. An independent poll confirmed this and put The Monolith in second place. Tellingly both of these designs retained much of the topology of the existing Gardens. Word on the street was that The Granite Web was not a popular choice, but we’ll never know for sure, because a decision was taken not to release the results of the so-called public vote to the public. It was then announced that the winner of the private-public vote would be put forward to the selection panel, along with another design. The self-appointed selection panel consisted of Sir Ian, some other influential people from the oil industry, an architectural consultant on the project payroll, and a councillor who backed the project. The two designs discussed were the acknowledged public favourite, The Winter Garden, and you’ve guessed it, the joker in the pack, The Granite Web. When the panel announced the result, it should have come as no surprise to anyone that they had chosen The Granite Web, yet there was a shocked silence, and even those had come out in favour of the redevelopment initially appeared bemused if not downright confused. The original Civic Square was mooted to cost £140m, with £50m coming from Sir Ian, £20m from the private sector, and the rest to be borrowed through a Tax Incremental Funding (TIF) scheme. Any over-run would be covered by the council (read local taxpayer) . Only £5m of the private sector contribution has materialised thus far, but there has been an announcement that The Granite Web would be significantly less expensive to build than the previously-envisaged, but somewhat less complex, civic square. Sir Ian has offered to personally fund up to £35M of any cost over runs, should they occur. The TIF proposal cheerfully bends all the guidelines of TIF funding. TIF is intended to be used to redevelop brownfield sites, with the loan being repaid over a 25 year period through increased rates recouped from any businesses setting up in the redeveloped area. The city council had already approved planning permission for two new industrial estates on the outskirts of town, under the business case for the TIF funding, these new estates become part of the TIF zone, so in The Granite Web’s case, sections of the TIF zone are located several miles away from the actual redeveloped area. The predictions are for 6,500 jobs and £122m annual revenue to the local economy, all based on the new industrial estates, which have no obvious linkage to The Granite Web, operating at full capacity. Even if one were to accept that any new jobs could be somehow attributed to The Granite Web, the figure of 6,500 seems unlikely given that the London Olympics is only projected to create 3,500 jobs. Either way, the setup feels a bit shaky; the truth is that these jobs and their associated revenue will accrue with or without The Granite Web. By this time, councillors seemed to be getting edgy and unwilling to green-light the project, so they decided to hold a public referendum. Any group wishing to campaign was required to adhere to an £8,000 spending limit, and for this they were provided with 300 words of text in the voting pack. The packs went out, but unfortunately some of the Retain lobby’s statements were mangled due to a ‘computer error’. The voting packs were closely followed by a big money public relations mail bombing campaign by The BiG Partnership promoting The Granite Web. Publicity materials went through every letter box, pro Granite Web articles dominated the press, and adverts were played around the clock on the local radio stations. Apparently this expenditure was permitted by virtue of being funded by an ‘unregistered’, and as yet anonymous, campaign group – whatever that means! I guess it’s a bit like not having to pay tax because your parents never applied for a birth certificate, who knows? By this point, things were becoming surreal to say the least. The referendum closes on 1 March and it’s a bitter fight that has divided the city. For example, an oil company boss has made a complaint to the police alleging mail hacking and cyber bullying. The police claim they are taking this allegation seriously. There have also been two arrests possibly related to claims of vote-rigging, but ultimately no one was charged. The town has gone berserk and it’s civil war all over Facebook. It’s as if we’re all experiencing a really, really bad shared dream. I just dread to think what we’ll all be waking up to on Saturday morning. Aberdeen Youth Council’s former head Sean Press resigned because of ‘a conflict of interest’, citing his involvement with ACSEF the ‘pro-business and development body [which] is fully supportive of the City Garden Project’ per the Press & Journal. Now Aberdeen City Youth Council, the official voice of young people in the city, has spoken out against the proposed development of Union Terrace Gardens, describing the plans as “unwanted” and “potentially devastating to young people”. As a result, the group has registered to submit 300 words in the voter registration pack. The group also criticised the City Council in its involvement of young people in the decision-making process, after they discovered that only 113 young people from just two schools were consulted with. 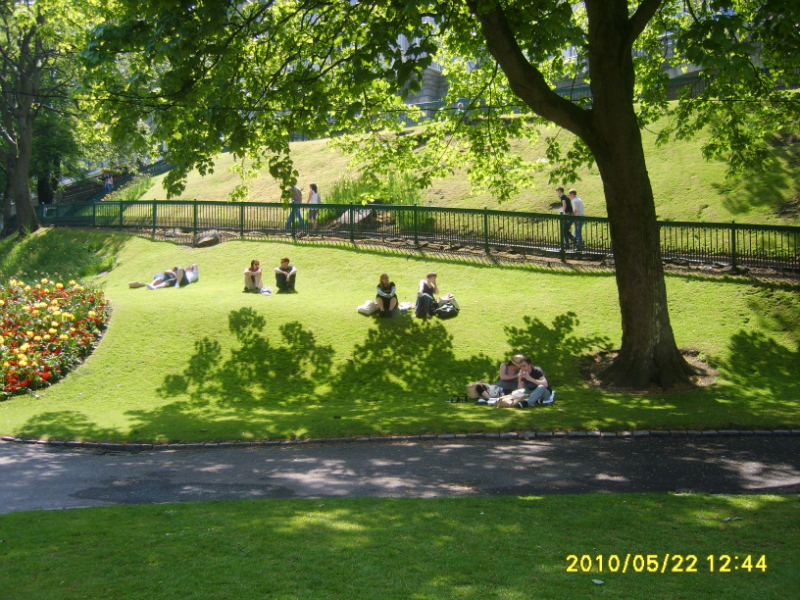 In the Youth Council’s own consultation 98% of 14-25 year-olds were in favour of retaining the Gardens. The financial security of the City Gardens Project (CGP) concerns the Youth Council. The Aberdeen City Youth Council (ACYC) are worried by the lack of a plan to cover the possible failure of the risky Tax Increment Funding scheme. After multiple requests for detailed financial information from councillors on the monitoring board were ignored, the group became very apprehensive over the CGP’s feasibility. One of the main sufferers of cuts to public services is Aberdeen’s youth. Northfield has the highest rate of child poverty in the north-east of Scotland and the Council cannot commit to such a financially unstable project when they are closing key services to the youth in many areas. It was claimed that the CGP would reduce crime rates in the city, which young people are frequently blamed for. Both final designs for the CGP have direct access from Belmont Street and Union Street, home to many pubs and clubs. A £170million project of this nature will not cure the violence and crime that Aberdeen faces. Not The First Choice – Webs, Worms And The CGP. The final design for the City Garden Project was picked this week. The proposed plan is to replace Union Terrace Gardens with a futuristic design of curving walkways and grass called the “Granite Web”. The announcement stoked up even more controversy as it appears that the design was not the first choice amongst those that voted in the exhibition in October last year. Favoured was the “Winter Garden”, the design with the big greenhouse resembling a giant glass worm. “Pointless poll. 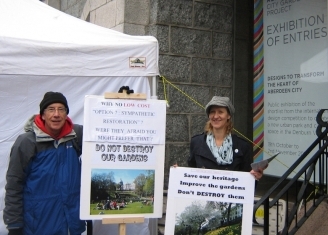 Of the six designs submitted for the development of Aberdeen’s Union Terrace Gardens, one emerged as the clear favourite during a protracted public consultation in which the Aberdeen electorate took part. Yet a panel of judges has selected one of the other designs, and the Aberdeen public is apparently to be given the choice between this one or nothing. What is the point of holding a public consultation and treating the result as if it didn’t exist? 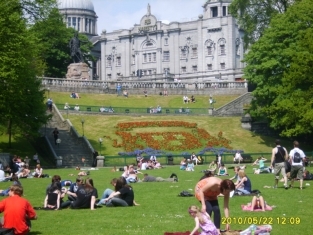 It is not the first time that a consultation on the fate of Union Terrace Gardens has been ignored. A public consultation run in 2010 saw a majority of the public rejecting the scheme. “Diller Scofidio & Renfro’s ‘granite web’ of interconnected walkways has been sold as a vision of the future for Aberdeen. However the seductive sixties sci-fi vision presented may be out of date before the journey from concept to reality has even begun. In their submission the architects have spun a tale of making Aberdeen “throb” again but the history of elevated walkways and underpasses, as anyone who has ever traversed any concrete New Town will attest, is often dystopian. Others have been more sceptical. It has been variously likened to a Teletubbies TV set, a skatepark and even ‘Mounthooly Roundabout on steroids’. The City Garden Project have however reached for their dictionaries to praise the ‘vision’, with press releases abounding with words such as ‘transformative’, ‘vibrant’ and ‘dazzling’. Despite the hype there are very few facts being presented. We still do not know how much it will cost or how long it will take to build. In another development, Aberdeen City Council are to hold a special council meeting next Wednesday to discuss the City Garden Project. The report for the meeting asks councillors to approve the final City Garden Project design , expects the private sector to commit at least £70 million towards the project and discusses some of the land ownership issues. There is no discussion in the report as to what happens if the City Garden Project goes into massive cost over-run. In 2009 the then Chief Executive, Sue Bruce, decreed the private sector would be responsible for any cost over-run. Since then, no procedure has been discussed on ensuring agreement about this. In my opinion, Aberdeen City council are being grossly negligent here. 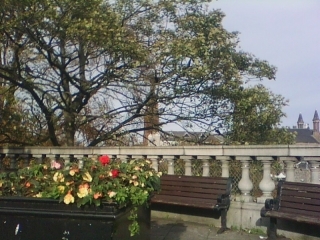 Councillors are effectively being asked to approve the final City Garden Project design ahead of February’s public referendum. It is difficult to see how councillors can approve a project when there is no clear statement as to what the scheme is going to be used for. The requests to councillors to spend up to £300,000 on legal costs from Council funds will be very controversial. We have been repeatedly told that the City Garden Project will have no impact on Council budgets, yet this is clearly not the case here. Some will ask how such costs can be justified when services and amenities are being drastically cut elsewhere. Polling cards for the referendum are to be issued to Aberdeen residents on or around the 16th February. We will be asked for a third time – what do we want our city centre to look like? The public are being treated with disrespect on this issue. Nevertheless, Aberdonians should ensure that they vote in the referendum. This one counts.